It is a very exciting time for everyone working with Dynamics CRM, Dynamics AX, and Dynamics NAV and other applications in the Microsoft Dynamics Suite. Microsoft has a vision to change the way organisations purchase, build, and use business applications and in this post I will discuss some of the technologies Microsoft released recently as part of this vision. Organisations and their employees face many problems while they are performing their day to day duties. Some are business critical while others, well…, we just learn to live with them. Here’s an example of one those trivial problems. In one of the offices I used to work, in the office kitchen there was a Billi tap, the one with hot and cold water. For some reason, the water started flowing very slowly. Usually, it takes about 10 seconds to fill a glass, but this took about a minute. This went on for at least 2 months. I did a calculation and if we had 100 employees and each employee had 3 glasses of water a day, this slow tap has wasted about 166 hours. What if there was an App that is easy to use and cheaper to build where you can report leaky taps, coffee machine’s out of coffee, or the network cable on the floor which is an OH&S risk. What would happen, if I go to the CIO and pitch the idea. He/She would probably say, do you have few $100,000 for a team of 5 for 6 months? He/She will surely kick me out of the room. This is only a simple example where organisations can improve their efficiency, reduce costs, and improve staff satisfaction. What about your great idea that could improve customer satisfaction, sales, inventory management, or personalised marketing. Or if you are a government organisation, the ideas that could improve citizen engagement, application/licensing approval processes, and compliance with government legislation. The real problem is time and money. You need infrastructure, development tools, architects, developers, business analysts, test analysts, and project managers to manage the whole thing. Of course, you need some or all of this for most IT projects. To secure funds for a project, specially to test an idea, the cost must be kept to a minimum. As we know, less code means less cost (generally, but there are exceptions). Microsoft just released their answer to this problem. Along with Dynamics 365, Microsoft released their Business Application Platform that can be used to build sophisticated business apps using PowerApps which can be automated using Microsoft Flow, while data can be stored and managed using Common Data Service (CDS). PowerApps, Microsoft Flow, and CDS are designed in a way that doesn’t require coding. This doesn’t mean that developers will be out of jobs. Developers can use these services to build apps very quickly and also extend the functionality using Logic Apps, Azure Functions, and custom APIs. 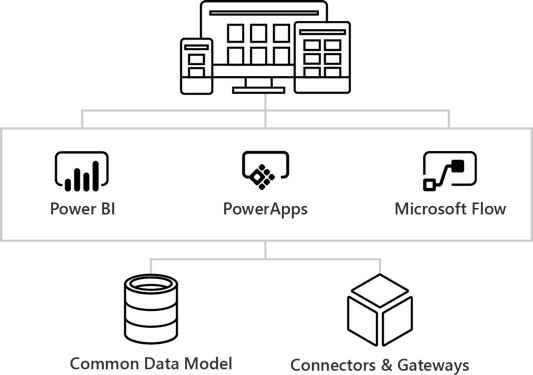 PowerApps is designed to easily connect to external data sources using connectors and even to your on-premises data via Gateways. Using Microsoft Business Application Platform, organisations can iteratively build and deploy fully functional business applications in no time and reap the benefits quickly and cost effectively. What is Microsoft Common Data Service? (Note: During preview this service was referred to as Common Data Model (CDM)). The Microsoft Common Data Service (CDS) is an out-of-the-box, cloud resident (Microsoft Azure based), business database for storing and modelling business entities. PowerApps comes with a visual designer (two versions: Web based and Desktop) to easily create apps for your mobile or tablet device. If you familiar with PowerPoint and Excel, you can build a mobile app with PowerApps. There are pre-built templates to get you started quickly or you can build your app from scratch. There are already number of connectors to connect to data sources such as Dynamics 365, Salesforce, SharePoint, Twitter, and Facebook. While coding skills are not required to build sophisticated mobile apps using PowerApps, for more complex requirements, developers can extend the apps using already available Microsoft Azure platform services. Microsoft Flow is an iSaaS (Integration Software as a Service) product where citizen integrators can setup automated workflows between multiple apps and services. Flow comes with many templates for common scenarios and the flow team continues to build new templates. You can also create flows from scratch connecting multiple services such as Common Data Service, SharePoint, Dynamics 365, Slack, and Twitter to name a few. In this post, I provided an overview of the Microsoft’s new Business Application Platform and it’s key components, PowerApps, Microsoft Flow, and Common Data Service. In Part 2 of this series, I will be building an app using PowerApps to resolve my slow tap problem and other similar problems.